Too bad not all presidents (including you-know-who) are as capable in their jobs as Prezident Brown is. Or as creative, or as concerned about society’s direction, or as fully human. But that would truly be asking a lot. 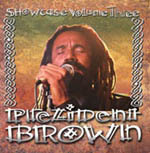 Here we have the Prezident’s third “showcase” double CD set, an emotional and inspirational reggae delight from start to finish—real value for money. The first CD is a new compilation titled “Prepare Ye The Way,” while the second is a live album recorded at the Renegade Festival, Mt. Shasta, California. If you’re already a fan, you may be concerned that almost everything on the live album duplicates a studio track from an earlier “showcase.” If so, be assured that a) these dynamic reinterpretations are thoroughly enjoyable as separate entities, and b) the strength of the song writing on CD 1 will keep you distracted anyway. “Real Thing,” another plea for integrity, uses unusual but perfect metaphors. The title track, “Prepare Ye the Way”, is perhaps the highlight (it’s hard to pick just one) with its engaging melody and pointed lyrics. Although somewhat lightweight in comparison, “Automobile” may be the first song to slip into gear for you—it’s shiny and sleek, with horsepower enough to carry us very smoothly to unexpected places. The eleventh track, “Protect I Oh Jah,” is a very personal prayer for inner strength, and is followed by its dub as the CD’s final offering. The 16-track companion concert set is over an hour’s worth of similarly catchy, powerful and often beautiful songs, and the enthusiastic audience never intrudes unduly, thanks to expert recording techniques. The gorgeous “To Jah Only” introduces the concert— acoustic guitar strumming, spare bongo drums, soulful vocal with restrained delivery, subtle background voices. It’s altogether exquisite. From there, Brown continues to exude passion and intelligence in equal measure as the band heats up to dancehall tempo, although there’s still lots of variety in the arrangements.